Top-Rated Kitchen Dish Towel Set! This 12-pack of 100% Cotton Flour Sack kitchen towels (28 inches x 28 inches) is a popular and economical cleaning option for all purposes. Flour sack kitchen towels are extra absorbent and practical for hand drying or cleaning up messes in the kitchen. Professionally hemmed edges are carefully graded for quality control and product durability. Machine wash and dry. Ring spun Cotton provides optimal softness and absorbency. Perfect for drying hands or cleaning spills. Matching value-size set for quick kitchen makeover. Can be bleached as well. Ringspun cotton is constructed from a combination of long and short staple yarn. Ringspun fibers are tightly twisted together to create a stronger, smoother and finer yarn. This method produces a more refined feel than that of a basic combed cotton yarn. 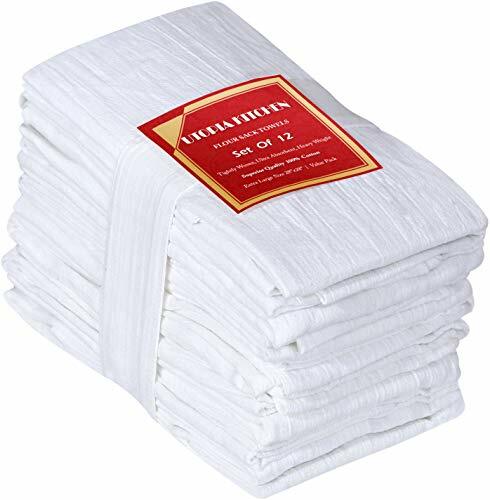 VALUE PACK - The 12-pack provides you with ample flour sack towels for all your household needs for today, tomorrow; and the future! With the perfect size of 28 x 28 inches, anyone can handle these towels with ease! COUNTLESS USES - Due to being highly absorbent, these towels are great for dust cloths, drying hands, wiping stains, cleaning windows, as cheese strainers, salad spinners, a wide variety of household chores! As good as having a magic wand in your hands! EXPERT CRAFTSMANSHIP - Lightweight and lint-free, the professionally hemmed edges are carefully graded for quality control, and product durability; helping the towels last for all your needs in the long run!